My daughter and I had an AMAZING time at the beach: white sand, clear water, sand dunes. Wow, we had an absolute ball. All was going well. My daughter even met a few friends to play with at the beach. One of them, a little girl (can’t remember her name) was thrilled that my daughter is a cartwheel enthusiast and the two of them somersaulted down the beach. Under my watchful eye, they also cavorted in the water and were having a fabulous time. Until. Until. The two girls were stomach down lying next to my beach blanket. My ears perked up when I heard the little girl whisper, “Are you black?” My daughter looked at her and said something like, “No, I’m brown. Does that look black to you?” holding up her arm for review. The other little girl looked baffled. Her tone of voice had sounded like she’d come upon some great secret, this brown little girl next to her was an alien! But wait, if she’s not black, is she really an alien? Her face looked dejected. Some of you may wonder why we train our children to say that they’re brown. Of course, we are also very proud and knowledgeable of our Black heritage, exposing our children to history and current events as much as we can. However, we want our children to know: 1) that race is a social construct and 2) there are BILLIONS of brown people around the world and we are part of that Diaspora. I believe that people’s conception of race start in scenarios just like this one. I was grateful that my daughter understood that her skin does not define who she is. But wait, the day held one more surprise as the little girl turned to my daughter and made one more comment, this time about her hair. P.S. 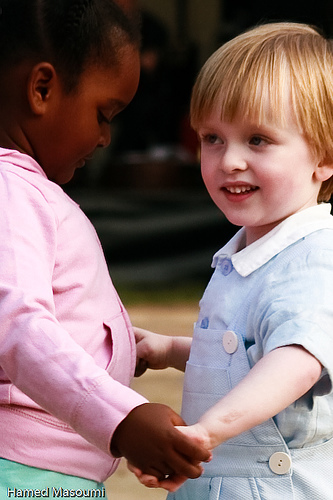 : Here’s an interesting article I came across on interracial friendships by Nadra Kareem Nittle (8/7/10) on news.change.org: http://news.change.org/stories/what-are-the-barriers-to-interracial-friendships. Curious to know what you think about our beach experience and the article.